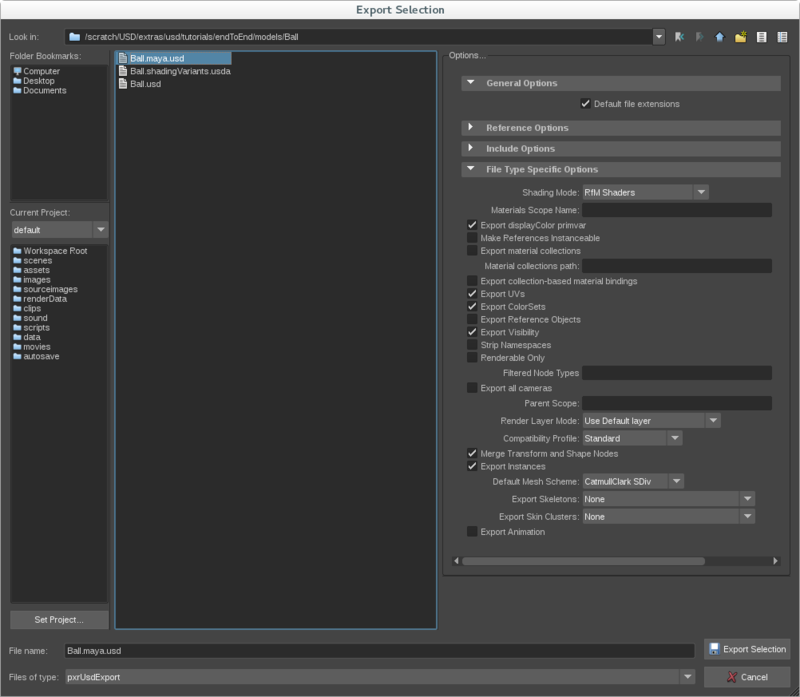 Ensure that you have setup your Maya USD Plugins and Katana USD Plugins properly. This tutorials aims to show USD in an extremely simplified pipeline. The files for this tutorial live in USD/extras/usd/tutorials/endToEnd. assets: This folder contains some files that are used in the tutorial. It also contains some of the geometry in case you do not want to author them yourself. scripts: Some generic scripts we use in the tutorial. We've tried to document them. Feel free to poke around, or run them with -h.
tutorial_scripts: Scripts specifically geared toward this tutorial. They may have hard-coded paths that are intended to be run from the tutorial root. We've also documented those, but they are intended to be used primarily for this tutorial. We'll first run a script that bootstraps an asset for us. The following will create an empty asset named "Ball" inside the directory "models/Ball". There is no geometry but if usdview opens without errors, we're off to a great start. We'll be adding geometry in the next section. Putting models in their own directories is convenient for managing versions, etc. but how you layout files at your site will likely differ. This particular structure is an example and is not required to get USD to work. If you don't want to do the modeling in Maya, or if you have run into any errors configuring your environment, you can use the geometry provided by the tutorial and then skip to the "Shading Variants" section. You should see a sphere-like mesh for the Ball asset. 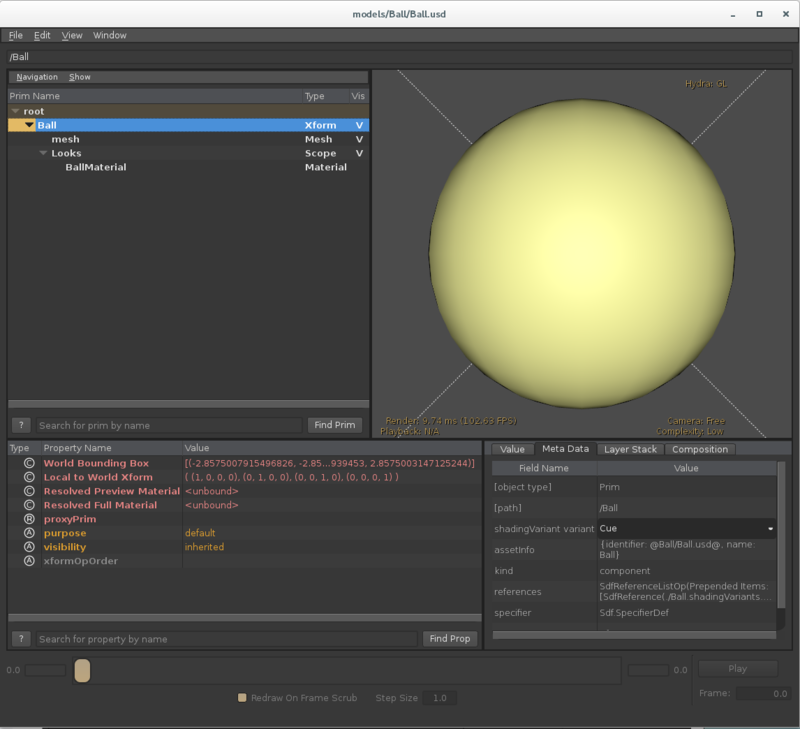 To export this scene, select the sphere, select File -> Export Selection, and choose pxrUsdExport under Files of type. Be sure to choose RfM under shading mode. 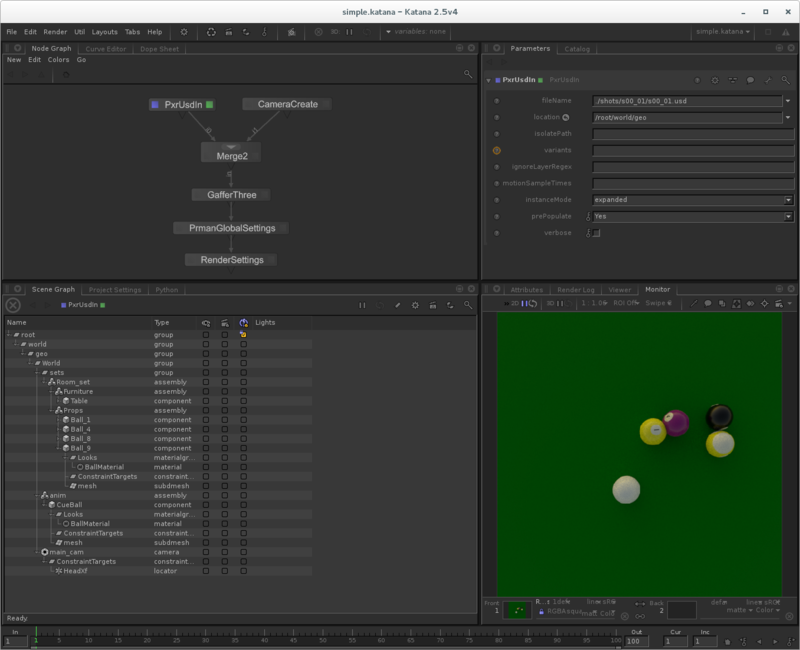 In the file browser, find "models/Ball/Ball.maya.usd" and save over it. Open the Table.ma file in Maya. Select the table in the scene, then select File -> Export Selection. Choose pxrUsdExport under Files of type. As with the Ball, be sure to choose RfM under shading mode. 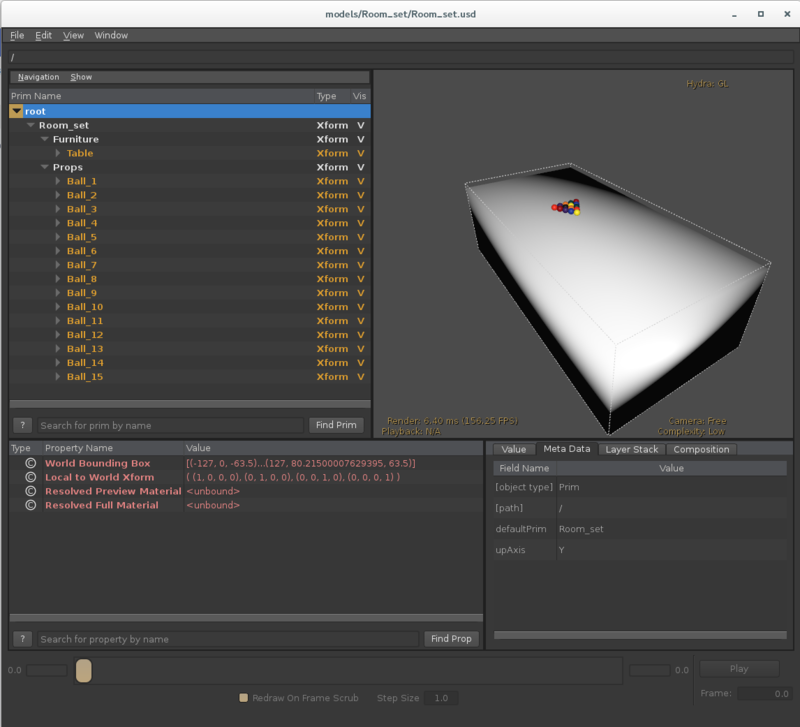 In the file browser, find "models/Table/Table.maya.usd" and save over it. At this point, you should have geometry and shading information authored for both the Ball and Table. If you were not able to complete this section, see the note above for instructions on copying over pre-exported assets. We will add shading variants to the Ball entirely through code. Please see tutorial_scripts/add_shadingVariants.py. This script assumes you've been following along the tutorial and is expecting a Ball model to exist with shading from the Maya file. If you've tweaked things, you may have to go in and modify that script. We are keeping the networks very simple for this tutorial. If you look at the Ball model in usdview, and then with /Ball selected, select the Meta Data tab and use the shadingVariant drop-down menu to change to variants with different colors. We'll create a set model that brings together the Table and a standard set of 15 Ball models together. This script assumes you've been following along the tutorial and is expecting an Ball and Table model to exist. It also makes some assumptions about the size of these models. If you've tweaked things, you may have to go in and modify that script. Also, note that we're hard-coding absolute paths to the other assets. The path resolver plugin provides a better mechanism that allows you to locate assets by other means. 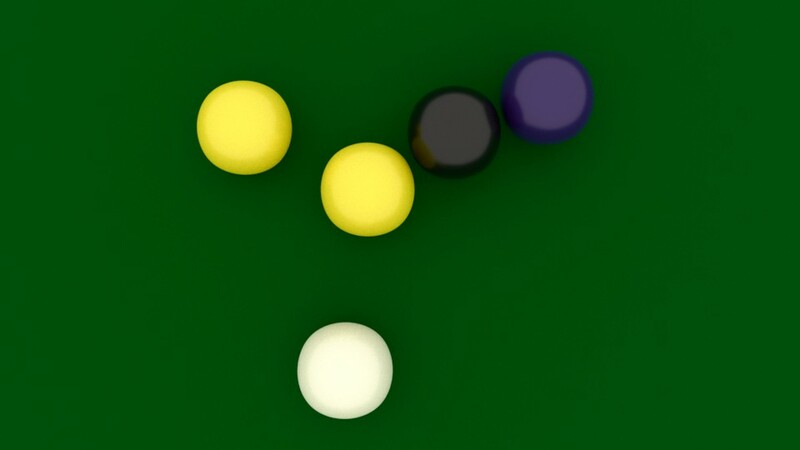 You may need to move the camera around to see the table and balls as pictured below. Here, we'll mock up an example of how a sequence and shot might be structured. This will illustrate some of the benefits of USD composition. Since your structure likely varies, we'll first define some terms and explain the structure we're about to create. A sequence is a collection of related shots. A shot will include (by sublayering) all the scene description that is associated with its sequence. This structure allows you to put opinions that affect multiple shots in one location. We will also make each sequence inherit opinions from a global/shared shot.usd file. This makes it so we can define the overall structure in one place. That's a good place to put things you will need everywhere (for example, the camera). USD has no notion of what a "shot" or "sequence" is. Again, this is just an example and this structure is not required for USD. This creates a sequence in the directory shots/s00 that references assets/shot.usd (note the -b argument to create_shot.py authors that reference verbatim). Now, you should have the layer structure defined in the previous sections. Opinions from the shot will override the weaker opinions that are in the sequence or the "global" layer. In an actual production, you'll probably structure your files to make the dependency between s00_01 and s00 more evident. Since this is a newly created shot and sequence, there shouldn't really be anything in it except for what was in assets/shot.usd, which should just be the camera. Now we'll start running some scripts. First, at the sequence level, we'll bring in the Room_set asset. # feel free to introspect the resulting files in between each of the following. The USD file is read in with the provided PxrusdIn node. 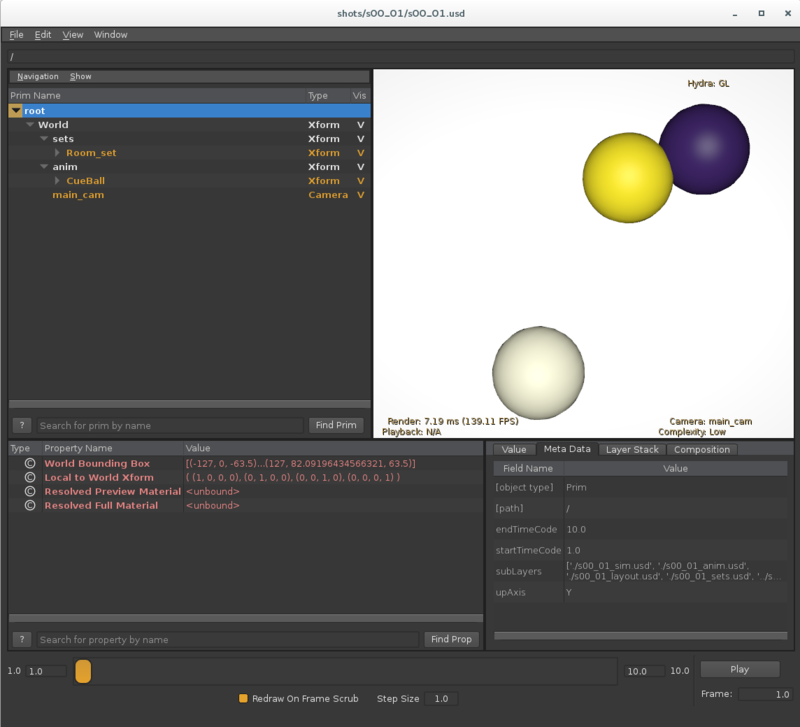 An optional camera is merged into the scene (to work around a known issue when rendering from the camera in the USD file). A simple light is created in the gaffer node. To render the scene, right-click on the RenderSettings node and select "Preview Render". Feel free to experiment with this tutorial by modifying scripts or adding your own geometry and shading.